Which Knife You Should Carry for Fishing? It's a common saying that a fisherman without a pocket knife isn't really a fisherman. If you really think about it, fishing involves a lot of things that require little maneuvers that simply can't be time -taking. You need to get them done as soon as possible, with the littlest effort needed. From cutting lines to removing hooks, you need to have a friend at your side and that is a friendly folding knife that fits in your pocket. A jack knife, which generally has more than one blade and a simple hinge at one end, has been a fisherman's best friend since time immemorial. If fishing is one of your favorite hobbies but you don't own a good knife, you need to change it right now. So let's get you started! Since you will be using your knife a lot, you definitely need a multi -blade. If you want you can get a Swiss knife too. First of all, you need to take a hard look at the kind of blade. For long, we have been using the basic plain edged knives but there are more options if you feel like expanding its usability. It all comes down to the type of cut you need. You would either want your blade to allow a push cut (like shaving or peeling) or you want a pull cut (like cutting a rope). A plain edged knife is better at performing push cuts but it is not exactly capable of performing a pull cut. So a plain edged knife may not serve you the best here. The other two options are a fully serrated edge and a partially serrated edge. In layman's language, serrations are the teeth embedded in the knife. A fully serrated edge comes handy in specific situations like sawing while a partially serrated edge can be used both ways. So a partially serrated edge is the best bet. The length of the blade is totally your call, depending on your own palm length and your comfort. The type of blade also affects the knife's ability. Clip Point- These are one of the most popular blades because of the sharpness of its tip. Hence the name. These blades are best for everyday uses. Drop Point- This is the best all-purpose blade you can find. The straight blade that slopes down at the end is best for all types of usage. Tanto Point- This blade resembles a chisel (tool) and looks quite unique. It is best suited for push cuts. Spear Point- It has an extremely sharp point that turns out to very useful in piercing. The blade edges have to be kept sharp. Trailing Point- The blade has a curvy back which makes it quite lightweight. This one is perfect for slicing. Hawksbill- As the name suggests, the blade resembles the curved shape of a hawksbill turtle. Not an everyday use but can be used for little jobs like opening a letter. So it's mainly a collectible. Straight Back- This is the most traditional blade out there, the same types that we often find in our kitchens. Sheepsfoot- This is the flattest knife you'll get; it would best serve those who want a beautiful weapon to show off. Wharncliffe- This resembles sheep's foot quite a bit but if you look closely, you will notice that the blade curves when you get to the handle. This makes Wharncliffe a more useful blade. Needle Point- The pointy needle part is good for piercing but it is also quite sensitive at the same time. These are best for a little self-defense. Pen- Generally found on Swiss Army knives, these tiny blades prove to be a great tool for small tasks. Spey- Spey blades were once used to spay (sterilize) animals. They still prove good for skinning animals. There are two things that greatly affect the quality of the blade. The first thing is the chemical composition of the blade and the second thing is the hardness of the blade. Different blades are made with a different variety of materials ranging from carbon, cobalt, chromium, nitrogen, magnesium, molybdenum, nickel, phosphorous, sulfur, vanadium, silicon, and tungsten. The richer the carbon content in the blade, the better the edge. But the higher carbon content leads to the risk of corrosion. So, the need to maintain a certain balance to get the right carbon content is absolutely necessary. The second factor i.e. hardness is something that is decided by using a specially designed machine. Even though this is something that you simply can't decide on your own, you can always ask the seller. There is never any harm in asking.Take care of buying blades that lie between the ranges of Rockwell 55 to Rockwell 60. The Rockwell Hardness Code is used as a function of heat treatment and the carbon content. Keeping a pocket -friendly folding knife is one trend that never gets old. This tradition has been going on for centuries now ever since the First Century Romans. They created the first folding knives and this has been going on ever since that time. You need to carry this forward. It's always nice to turn a hobby into something that you actually care for. The next time you plan to go out for fishing, do check your things and make sure that you have got the perfect folding knife for the occasion. Go a step ahead and tell your friends about this new-found knowledge. Who knows what they might have in store for you? Just try and take care of the above -noted things before you make a final decision on what sort of blade you want. Rest everything aside, your knife will be your very own. It will represent your sense of style and the kind of demeanor you always want to see around you. Treat your blade as a very own part of your body and you will never feel the need of calling it a knife. 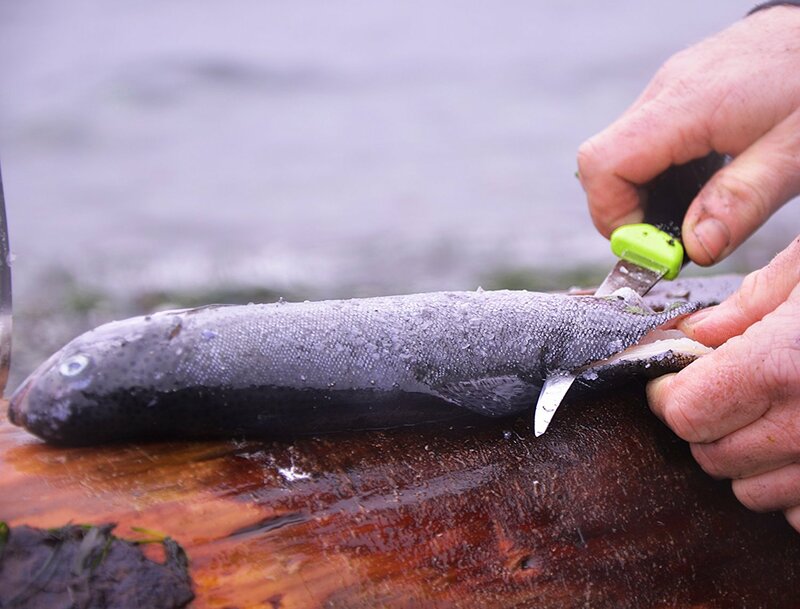 Next time you go fishing with your friends, apart from the fishing rod, the bait and the pints of beer that you take along with you, don't forget to take the fishing knife.